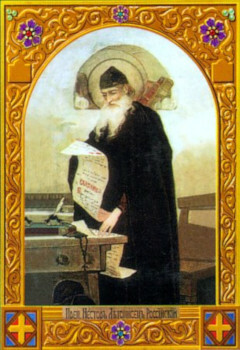 The Monk Nestor the Chronicler was born at Kiev in 1050. He came in his youth to the Monk Theodosius and became a novice. The Monk Nestor took monastic vows under the successor to the Monk Theodosius, the hegumen Stephen, and under him was ordained monk-deacon. In the monastery the Monk Nestor had the obedience of being the chronicler. In the 1080s he wrote the “Account about the Life and Perishing of the Blessed Passion-Bearers Boris and Gleb” in connection with the transfer of the relics of the saints to Vyshgorod in the year 1072. In the 1080s the Monk Nestor also compiled the Life of the Monk Theodosius of Pechersk. And in 1091 on the eve of the altar-feast of the Pechersk monastery, he was entrusted by the hegumen John to dig up out of the ground, for transfer to the church, the holy relics of the Monk Theodosius. The chief work in the life of the monk Nestor was the compiling in the years 1112-1113 of the “Tale of Bygone Years.” “Here is the tale of years gone by, from whence the Russian land came to be, who at Kiev started first to be prince and from whither the Russian land is arrayed” – so with the very first line the Monk Nestor specifies his purpose. His is an extraordinarily wide circle of sources: of prior Russian chronicle accounts and sayings, monastery records, the Byzantine Chronicles of John Malalos and George Amartolos, various historical collections, the accounts of the boyar-elder Ian Vyshatich and of tradesmen and soldiers, of journeymen and of those who knew – all set together by him with an unified and strict Church point of view. This permitted the Monk Nestor to write his history of Russia as an inclusive part of world history – the history of the salvation of the human race. The Monk Nestor died in about the year 1114, having left to the Pechersk monk-chroniclers the continuation of his great work. He was buried in the Nearer Caves of the Monk Antonii of Pechersk. Next Next post: Science of the Saints, 10-XI-2018 (28 Oct.), Holy Martyress Paraskeva of Iconium.